Some would-be robbers rammed into a 7-Eleven in Upper Marlboro, Maryland, overnight hoping to steal an ATM, but just wound up leaving the convenience store and a medical office with major damage. Prince George's County police said at least two suspects used a pickup truck to slam into the 7-Eleven on Watkins Park Drive about 2:35 a.m. Wednesday. Surveillance images show the suspects dressed in all black and wearing ski masks and beanies to hide their identities. Later Wednesday, crews were cleaning up and making repairs at the 7-Eleven, where it looked like a bomb went off. 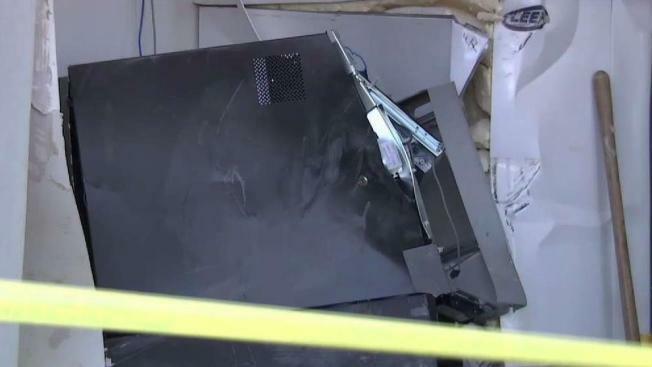 The suspects' truck brought down a wall, glass and steel beam — and the ATM looked like a partially crushed soda can. The crash also pushed in a wall at the adjoining Omni Medical Center. Debri littered the floor and a hole opened between the 7-Eleven and the office. Police are investigating whether the attempted robbery is the work of the same group that botched two other ATM robberies in February in D.C. and Prince George's County. In both instances, they used a truck to ram into 7-Eleven stores to get to the ATMs. In March, the suspects successfully took off with an ATM at a 7-Eleven in Lanham, Maryland, using the same operation.